Most local accommodation owners must be paid in cash. Some homestay owners provide the ability to be paid by bank transfer before you arrive, and a few of the busiest homestays now accept credit/debit cards. You’ll find “Can pay by credit card” in the features checklist on a homestay’s page if it can accept credit cards. (Apply the accommodation page Other features search filter of that name to quickly find homestays that can accept card payments.) A surcharge is levied by homestays to cover the bank fees charged for card use. Note that there’s no guarantee that your particular bank’s Visa or Mastercard will be accepted. Confirm with your card provider that you will be able to use it in Indonesian ATMs. 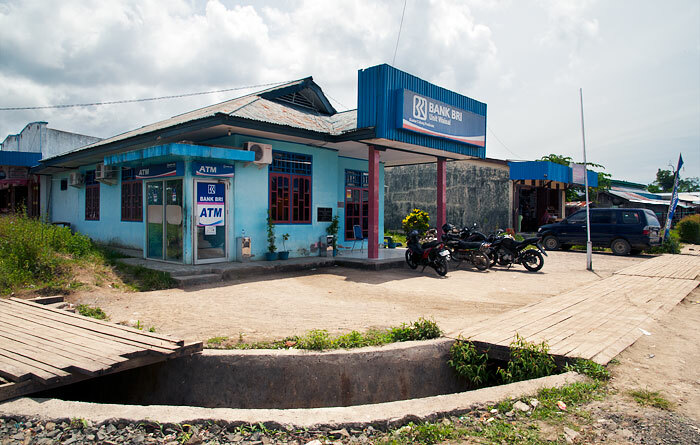 Most homestay card facilities are supplied by Indonesia’s Mandiri Bank, so it might also be a good idea to test that your card will work in a Mandiri ATM before arriving in Sorong. There’s no access to cash out in the islands. The only ATMs in Raja Ampat are in Waisai. If staying at a place without a credit card facility, you’ll need to bring a lot of cash. The largest denomination Indonesian bill is 100,000 Rupiah, so be ready to carry a sizeable wad of notes. To avoid problems and delays on arrival, the best approach is to work out how much cash you’ll need for your stay (including a margin for the unexpected) and get it all in Indonesian Rupiah before you land in Sorong. ATMs: Be aware that there’s no guarantee your card will work in all Indonesian bank ATMs. To avoid nasty surprises it’s recommended you test your card in a few different banks’ machines prior to arriving in Sorong. Also be aware of your daily withdrawal limit. There are many different Indonesian bank ATMs in Sorong, but the most convenient are the ones at the airport. They have fairly low maximum dispensing limits, but you can withdraw multiple times up to your own bank’s daily withdrawal limit. Exchanging Currency: It’s probably best to do this at a bank in Sorong. If you want to exchange US currency, be aware that most banks will only accept recently issued $100 notes. We don’t know what the requirements are for Euros or other currencies. Probably similar. Banks are not open on weekends and Indonesian Public Holidays. Options are much more limited in Waisai, but more ATMs are being installed every year. BCA, Mandiri, and BNI ones are usually the best to try first. Any taxi or ojek driver will be able to help you find those. Do they accept 100 australian dollar notes? Banks and moneychangers certainly would, Tom. Homestay owners need to be paid in IDR. Do banks/exchangers accept euro 50/100 euro bills as well waisai? We would be surprised if they did not Marjoleen, but have never tried, so can not say for sure. Firstly, thanks for your amazing website. Wouldn’t have managed to plan a trip for my wife and I without it. I’m flying from the US to Sorong at the end of November and would be grateful of your advice regarding money. I can get hold of IDR in the US but suspect the exchange rate would be much better if I take $ to Indonesia and change it there. – I only have 3 hours between arriving in Jakarta and flying out to Sorong, so I’m not sure I’ll be able to change it up at this point. – I land in Sorong at about 6am and hope to get the 9am ferry, so the banks there will be shut. Do you know if I will be able to exchange the cash in Waisai? Also do you know if it is still the case that you need $100 bills? Everywhere that we’ve ever changed money in Indonesia, you get the best rate for nice, new, high denomination bills, so yes – recommend bringing 100s if you can. Not sure if there would be a rate difference between Jakarta and Waisai money changers, but doubt it would be much if so. Thanks so much for your quick reply! That’s really useful. Last thing I wanted to clear up. I’ve read that if you use ATMs in Sorong there is a massive (circa 25% of the total withdrawal) fee. Have you any idea if this is true? Hi, I’m trying to work out how much IDR to bring with me to Raja Ampat. After accommodation, diving, transfer costs, is 8,000,000 IDR sufficient for 2 people for 2 weeks? Also, is it best to bring it from the UK? The only opportunity I’d have to withdraw from an Indonesian bank would be at the stopover in Makassar. We arrive in Sorong early and want to catch the 9am ferry so I’m assuming banks there won’t be open yet… are there custom issues carrying around 35,000,000 IDR? Thank you so much for your amazing website btw. I don’t see how planning a trip to Raja Ampat would be possible without it! Unless you also want to also do a lot of boat trips for sightseeing (or buy alcohol), then that should be fine. Don’t know if you’ve already accounted for the mandatory Entry Fee (1,000,000 per person), but even 6,000,000 would be plenty of spending money for 2 weeks. Probably best to get it all in the UK, and there won’t be any customs issues carrying that amount. As Raja Ampat is quickly developing, does anyone know if there are any money exchange facilities in or around Marinda airport, in Waisai? We’ll carry Australian dollars and not flying thought Sorong, but straight to Waisai. We will indeed fly from Sorong but only on a very short transit from Jakarta. Thanks again for such a lovely and helpful website. We will be arriving to Indonesia from Thailand. Can we change Thai baht to rupiah at a bank? Thanks! We can’t imagine why not Michael, but – having never tried – can’t say for sure. I’m thinking about sending money for my holidays about western union. Do you know how much money I get there at most? I need a lot to stay about two month at the islands and I don’t think I get all about the ATMs. Where are western union places in sorong and wasai? Everyone talks about US$. Are Australian $s also easily exchanged in Sorong Airport? Banks in Sorong would definitely change AUD. The airport moneychangers more than likely would too. Don’t know for sure, but imagine that, same as for USD, you’d get the best rate for 100 dollar bills. Yes, you can change Euros in Sorong, but we don’t know how the exchange rate compared to USD. And there are also money exchange counters in Sorong airport? International airports always have money exchange counters. Domestic airports (like Sorong) usually do not. We are going to visit you during November, so great !! Our flights : KUALA/MAKASSAR. We arrive late in Makassar and leave early to SORONG, so we can not go to the town to change money and we do not know if the currency exchange office are open late in Makassar airport and we are not sure if there are some in the airport. If we arrive in Sorong only with Dollars, is it possible to change it in a bank ? I rode maybe it is possible if we have only 100$ note (not smaller), is it a correct information ? If we can change in Makassar airport, is it better to change all our money in the airport or it is better to change in a bank of Sorong ? What is the best deal for us, what do you think ? Sorry, but I can’t remember for sure if there are money changers open late in the Makassar airport. I think there probably are, as it is an international airport. If not, you can certainly change money at banks in Sorong. Banks will change notes smaller than $100, but you’ll always get the best rate for 100 dollar bills. Banks will usually give you a better rate than money changers, but if there are money changers at the new Sorong airport it may be more convenient to change there, rather than have to wait for banks to open in Sorong. nous avons prévu un séjour dans les Raja Ampat en Juin. Serait-il possible de vous contacter pour avoir votre retour d’expérience, notamment sur les complications avec l’argent à amener, mais également tout autres infos utiles ? You will find the answers to most questions in our step by step guide. You are welcome to use the contact form if you still have questions after reading that. Can you please comment a bit on money safety? If we need to pay for everything in cash, it seems that we must bring easily 10MM to 15MM rupiah to the homestay. That’s a lot of cash. Is it safe in my bag with a lock on the bag? I don’t know how easy it is to change USD in Waisai – we haven’t seen any money changers at the port, which means you’d have to go into town. If we were you, we’d save the time and trouble and change it at the international airport in Jakarta! We’ve never heard of a single incident of money or possessions disappearing from homestay accommodation. We usually carry our cash inside a small (closed but not locked) shoulder bag along with passports and other personal items. When in the water we leave it in our room, unless we’re going somewhere in a boat, in which case we leave it in the boat when we hit the water. It’s always been safe. Can you please update on ability to change USD to Rupiah in Wasai? I am flying in and out of Jakarta on Sunday night and will arrive in Sorong Monday morning. If I need to change money in Sorong then I will miss the 9:00am boat to Wasai. So if I can be confident that I can change money in Wasai I will do so there. I saw on the website for an eco resort that their prices were excluding a 21% tax. What is the tax rate in Raja Ampat and what is it applied to? Do the prices you quote include tax? Those transport prices are covered on the How to get to Raja Ampat page. Airport to ferry terminal taxis are IDR 100,000 and the Express ferry costs around IDR 240,000 (or a bit more if you want the air-conditioned VIP section). you can go to a bank named BRI, I could change my $50, even $20 there. one of the ATMs at the airport (don’t remember the bank sorry) does dispense 100,000 notes and it is possible to withdraw 2,500,000 for one transaction. That’s certainly convenient! Thanks for the update Betti. Regarding money and cash. Exchange facilities in Sorong are not garanteed. Banks in Sorong accept ONLY 100$ note (no smaller bank notes) and are closed on week-end and holidays. Make sure you have enough rupiah with you before heading for Mansuar. Near by Raja Ampat Dive Lodge accepts credit cards with a 2.5% commission (if you are really stuck).